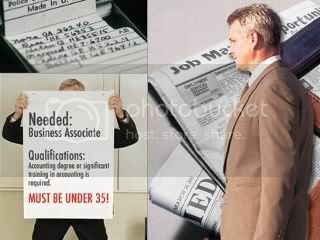 Interns Over 40: Do You Know The 7 Mistakes Job Seekers Over 50 Make? Do You Know The 7 Mistakes Job Seekers Over 50 Make? All of them worry about the generalizations some short-sighted employers make about older workers. Either they see you as overqualified and overpriced, or they believe you're inflexible and technologically challenged. Perhaps they suspect you're just biding your time and taking up space until retirement rolls around. But platitudes will only get you so far. 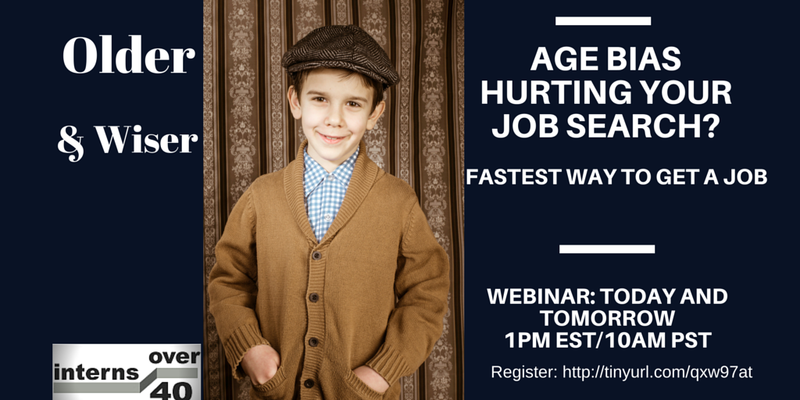 So let's talk about the top mistakes that hopeful hires over age 50 make and how to avoid them. I hear a lot of 50- and 60-somethings make this complaint. Yes, older candidates have to work harder to overcome discrimination, and no, it's not fair. But that doesn't mean every employer is hell-bent on shutting out all candidates over 35. Example: The site RetirementJobs.com lists more than 30,000 full-time and part-time jobs nationwide with "age-friendly employers." Other job sites that cater to older workers: Jobs 4.0, Retired Brains, Seniors4Hire and Workforce50.com. In addition, AARP offers this list of the best employers for workers over 50. So, please, don't tell me no one's hiring older workers. Save time by posting your resume instantly to 75 job sites. Start Here. You've been on this crazy hamster wheel we call "work" for at least three decades now, so you might as well milk the vast contact list you've amassed for all its worth. It's perfectly acceptable to reach out to former employers, co-workers, vendors, classmates and other colleagues you haven't corresponded with in a decade or two. (Searching sites like LinkedIn and Facebook make finding them a snap.) Not only will your peers understand, more of them are likely reaching out to their long-lost contacts, too. Get Your Free: 49 Benefits To Hiring An Older Skilled Worker. 2. Try to get an interview with an employer you are not interested in working for to practice your interviewing skills. You don't want to go to your first interview in a long time with the employer you are really interested in working for and make easily correctable mistakes. .
6. When applying for a job tell the employer you are willing to work on a project or temporary basis; this often gives you a leg up on younger workers or are often unable to accept this kind of employment. Temporary employment can often lead to full-time work. Contact someone who is at the employer who attended the same school you went to. 8. Volunteer with a charity or non-profit. Although in most cases there is little or no monetary compensation it is often excellent experience and can possibly lead to employment with a firm that is seeking that particular experience or appreciates your work effort. It is also easier to find employment while you are working as you have a better mind set. Looking for a job on a full-time basis is not a very rewarding experience. These are great tips- especially the one about winging the interview, since that's pretty common and doing the opposite is a chance to stand out. As far as another solution for some, it comes in the form of not looking for a job at all. What I mean is, thinking one can only be an employee is a kind of limitation that keeps many from learning skills that would allow them to grow other skills and income. For example, many have a computer, but it's usually used more for entertainment than anything else- even during hours when no job searching can be done. Something is off with that picture. For the first time in history, we are 3 feet in front of the world, yet few learn how to use it in a way to render 1) value to others and 2) long term income for ourselves. While there are many hyped-up websites out there promising the world and delivering little (I admit I spent too much money finding that out), there are also some exceptions, and if one looks long enough, there are some great gems out there that can give someone a track to run on. This particular resource is still largely unknown, but an increasing number of folks are getting income results from the teachings and resources there- (many of them free). It helped me build some good online income and though it's not for everybody, with over a billion people online and growing everyday, creating online revenue is an option more people should explore. I got started for the price of a sandwich and while I'm not even close to rich yet, it's far more productive than spending off-time watching TV sliding into debt waiting for the phone to ring, and it feels good to pay off some of those bills with some new skills I can take anywhere. Very nice article. My only concern is wasting an an employer's time with a practice interview for a job you aren't interested in. It isn't fair to the employer--and precious few are hiring, at least here in Arizona--and how good is anyone at faking interest in a job they don't care about? I'd suggest working with a trusted source instead and getting feedback, such as a professional recruiter. Also, FWIW, I've taken my graduation dates off my resume. I don't send out many resumes at this point as I'm self-employed, but I do get queries for temporary contract jobs and why advertise my over-30 status? Great article for a person locked into working for someone else. Ruth Ann is self employed now so she doesn't have to send out resumes. The searcher should sit down and really study whether they still want to work for someone else and look forward to getting laid off when they are even older. If they have any marketable skills they should make sure that they want to get back into the rat-race. My sharpeners say that they are no longer employable as they couldn't work for anyone after being in business for themselves. Try it you may like it. 2. Get a couple of different resume formats. Very useful comment! Hope to post this blog on my mentoring site. The greatest area of my frustration is the advice that I need to down play my hard earned experience and positions to be more attractive to a prospective employer. I thought about this for quite a while, and jsut don't believe minimizing a good career is a reasonable approach. I've heard much about the many jobs on retirement.com, but they are mostly hourly positions and at minimum wage. The issue for many over 40 or 50 age people is that moving from a well paying job to mimimum wage is not a viable option. Why should we accept lower pay after working so hard for so long ? Why should we be relegated to lower positions when we are better qualified than the people who are our prospective bosses. It's a type of betrayal to denigrate our acomplishments and experience by settling for lower paying jobs, or hourly jobs where we are way over qualified to do. Job seekers usually has lot of anxiety and they will exaggerate their resume, this will become a very big trouble when they appear for an interview.